Tonight I, along with a fair sized chunk of the local community, attended a meeting. It was intended to allow the exchange of information and consultation between Telstra and the locals, because Telstra want to place an antenna to enhance it's mobile network, at the top of an electricity pole outside our local shops. The antenna would apparently, emit low level non ionising radiation 24/7. On the pole, they are supposed to put a sign like this. Now this radiation is not the stuff of nuclear warfare and disaster that has caused a great deal of illness, death, malformation and anguish. That is ionising radiation. What we are dealing with, from the top of this tower, is non ionising radiation. Which means...? Well no one really knows. Hence the sign. According to the propeller head expert Telstra brought in tonight, this type of radiation is totally fine at the levels the antenna is emitting. He showed us lots of boring slides and talked in a boring voice. He showed the community nothing but contempt and disrespect, in every answer, to every question he was asked. He face was a permanent smirk. But of course, his kids bedrooms aren't 6 metres from the antenna are they? He was clearly planted by Telstra, chosen for his abrasive personality, allowing someone other than the Telstra rep to be the bad guy. We weren't fooled. We knew they were all bad guys (actually 8 bad guys and 1 token bad girl). The truth is (and Telstra is honest about this at least) no-one knows the long term impacts of these type of antennae. The oldest ones that are like this proposed one are only ten years old. There is no data beyond this. The long term effects could be heinous and devastating, or they could be nothing. Telstra want to improve their service. People complain about their service in the area. I am one of them. But I'm not so invested in my service that I'm willing to risk the long term health of those living close to the antenna. I could pick up a landline. I could move to my balcony to take a call. I could email. Yes I know I'm not running a business that depends on a reliable phone line. But there were business owners there, all the local ones. All against it. 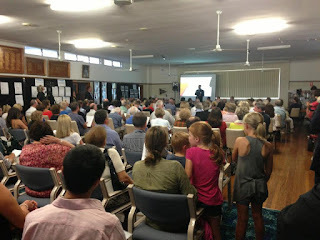 The result was (as I understood it anyway) that Telstra said they would not put up the antenna if there was a majority of the local community against it. They then failed to define how that majority would be calculated. Certainly if it was a majority of the community attending the meeting, there's no way it's going up. When asked for a show of hands against, the whole room threw their hands up. When asked who was for it, a tumbleweed rolled across the room. And then, if it does not go ahead, there is the contentious issue of where else to put the antenna? Many, many local landowners have refused to have it on their property. If Telstra can't use an existing tower to put their antenna on, they have to build a tower from scratch, get planning permission, more approval, more community consultation. They are so close with this antenna, they have put in all the infrastructure, they just need to place the antenna. It's hard to imagine them stopping now. Because what's perhaps the most incredible thing, they are legally allowed to place it. With no council approval. In a council which loves nothing more than a good development application, there is nothing required from Telstra for this, rather major, addition. The pole belongs to Ausgrid, and if they say ok, it's ok. Telstra had to get community support, which it said it had (it hadn't) and was ready to go ahead. A few wonderful, motivated individuals have driven the fight. They have been working tirelessly printing brochures, gathering community support, phoning, texting, one even chained himself to the pole. Their determination is catching, and whatever the result, they have done a brilliant job of rallying the community against the arrogance of big business.